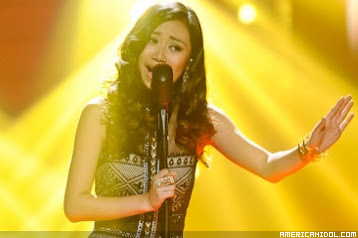 Filipino-Mexican American Jessica Sanchez is set to join on the US hit musical show "Glee." After the successful performance on American Idol Season 11 and became runner-up, she is now in near deal to join on the 4th season of Glee. According to TV Line site, "there are no details yet available on what role Glee executive producer Ryan Murphy might have in store for the 16-year-old California native, but the plan would be to have her join the cast midway through the first half of Season 4, after she completes her duties on the Idols Live summer tour." This is not the first for a Filipina to join on the US hit musical show. In way back 2010, the Youtube sensation singer Charice Pempengco was successfully included to the Glee cast as Sunshine Corazon. Meanwhile, Jessica Sanchez is set to visit Philippines together with the Top 10 finalist of American Idol Season 11 this September 2012. Comments or suggestions about "Jessica Sanchez cast on Glee Season 4" is important to us, you may share it by using the comment box below.